PLOT- NYU economics professor Rachel Chu is elated when her boyfriend, Nick Young, invites her to join him on his summer trip home to his family in Singapore. Rachel doesn't know that Nick is from one of the wealthiest Chinese families in Singapore. Rachel's world is turned upside down when she is scrutinized by Nick's friends and family, many of whom don't think that a Chinese-American woman from a poor background is the appropriate choice for one of Asia’s most eligible bachelors. They underestimate Rachel’s resilience and her bond with Nick, as they use every trick to break-up the couple. LIKE- Crazy Rich Asians in the first in a trilogy by Singapore-American novelist Kevin Kwan. For years, I have heard so much about Kwan and his series, yet it took seeing a preview for the film adaptation for me to take the plunge and buy Crazy Rich Asians. I had to read the book first! OMG! I absolutely could not put Crazy Rich Asians down. I read it over my birthday weekend: a birthday is a great excuse to demand that your family respect your desire to spend an entire day reading. It was such a page-turner that I stayed up until four am to finish it. Where to start... I guess the biggest reason that I fell in love with Crazy Rich Asians is Rachel. She's a great protagonist: strong willed, funny, charming...She is someone that you'd want to have as your best friend. She's such a likable character that it's heartbreaking to watch as she encounters so many issues on her trip to meet Nick’s family. Some of the problems are cultural, Rachel being an American, does not understand many of the Chinese traditions. Her mother tried to prep her for the trip, but neither Rachel nor her mother could have anticipated the other issue: The unimaginable wealth. Not many people on earth have been raised with the type of money that Nick’s family possesses. This aspect of the story makes it instantly unrelatable for pretty much any reader. A reader may not have been raised in the Chinese culture, but even a reader who can relate to that aspect of the story is unlikely to be able to relate to the money aspect. I was raised in an American single-mother household with a working mother and I found Rachel’s background to be very relatable. I may not be Chinese-American, but I still very much felt that Rachel represented me and I was instantly locked into her story. The incredible wealth is a very appealing aspect of Kwan’s novel. He has so richly painted his fabulous story-world, allowing the reader to drool over the amazing designer clothing and lush houses. Food plays a huge part in Kwan’s story. I was equally salivating over his descriptions of Singapore street food and the fancy wedding banquet dishes. Crazy Rich Asians is practically a tourism endorsement for Singapore. You will want to book a flight as soon as you finish the book. As far as the film adaptation, I relished in the visuals, especially of fairy tale wedding scene. It’s all gorgeous. In comparing the novel to the film adaptation, I found the movie to hit me emotionally. I cried and I don’t often cry in romantic comedies. Quite honestly, the film left me feeling overwhelmed and emotional all afternoon. I loved the bonds Rachel has with both Nick and her mother. The book didn’t pack the same emotional punch. As with all film adaptations, there were cuts and changes. The cuts were primarily related to Nick’s extended family and his relationship to them. The changes mostly strengthened the story, making it a tighter script and focusing on Rachel’s experience. There is a lot more comedy in the film too. It’s hilarious. Of course, as any book lover will tell you, you must read the book first- Yes, please do! However, make sure to see the film too. It’s great! DISLIKE- Nothing. Crazy Rich Asians is impossible to put down and full of heart. RECOMMEND- Enthusiastically- YES!!! I’ve already purchased Crazy Rich Asians for a few friends and have been talking it up. I can’t wait to dive into Kwan’s sequel, China Rich Girlfriend. The best part about being late to the party, is that the entire trilogy has been written and I don’t have to anxiously await the next installment! For Dan's birthday, I took him to see Steve Martin and Martin Short perform their variety show: An Evening You Will Forget the for The Rest of Your Life, at the Agua Caliente Casino in Rancho Mirage. This was a popular, sold-out show and unfortunately, I didn't buy the tickets when they went on sale. Luckily, the venue is fairly small. Every seat provides a great view. I managed to score seats that were in the middle, which also helped. Here is a panorama shot that shows our actual view. With the exception of a ten-year-old boy sitting in our row, we were the youngest people in the audience. I think this is more reflective of the glut of retirees living in the Palm Desert area, than it is of the nature of the show. The show actually started nearly twenty minutes late and I believe it was due to the large number of people requiring extra help to their seats- lots of walkers, canes, and wheel chairs! It wasn't a big deal for us, but perhaps if you plan to see a show in Palm Desert, have patience. The show started with a montage of their greatest film and television moments. 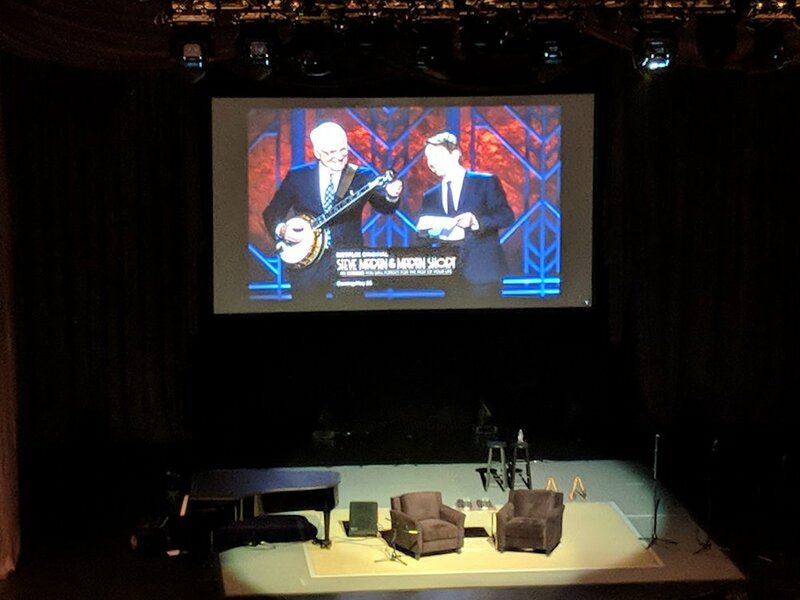 I had a momentary worry that the show was going to be like when we saw John Cleese in Portland, which was nearly all film clips and a huge disappointment. I'm happy to report that Martin and Short were NOTHING like Cleese. I'm a huge fan of Steve Martin, primarily his fiction writing. I wasn't a huge fan of Martin Short, but seeing him on stage has changed my mind. He's hilarious. Short and Martin both have quick wit and excellent timing, which shines when they are improving with audience members. They roast each other throughout the show, but it is clear that they are close, long-time friends who enjoy sharing the stage. I'm guessing that neither of these men need the money, so they tour for the love of performing. A majority of the show had both Short and Martin performing together, but there was a small segment where they each show-cased their own talent. Short spent this time talking about his early career and singing. Martin played the banjo, sharing the stage with the Grammy winning bluegrass band, Steep Canyon Rangers. Martin left the stage, to allow the Steep Canyon Rangers to play a song from their latest album. Acclaimed musical, Jeff Babko played the piano throughout the show, even getting in on the comedy act with Martin and Short. We throughly enjoyed the entire show and left the theatre with sore stomachs from laughing. I would not hesitate to buy tickets the next time Martin and Short are in town. They are both class acts and well-worth the ticket prices.